There is just something so precious about a new baby. I can't decide if it is the little toes or the tiny features. For me, it has to be their skin. Oh my, I could breathe in that sweet, new baby smell all day long. Mmm...it is so wonderful. My Isaac is 5 months old now (can you believe it???????) and although he is no longer a newborn, he still has that yummy smell. I just love kissing his chubby cheeks and snuggling my face close to his....there is just nothing better! Oh, how I wish I could hold onto these days forever!! The Soothing Bath Treatment was what we have used and it is FANTASTIC. I trust Aveeno and the products that they produce, simply because they are focused on using natural ingredients. Being a mom, natural is always my first choice and so Aveeno is a favorite brand! 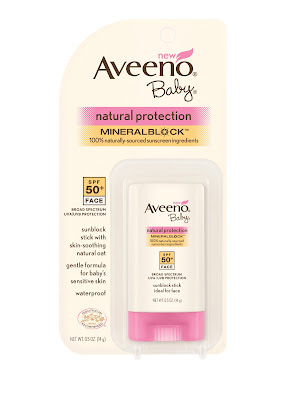 So, for this review I was sent an Aveeno Baby Natural Protection Sunblock Stick to check out and it is wonderful! This sunblock is SPF (sun protection factor) 50, which is great. I want optimum protection for my babies skin and so this really has them covered. What I really love is how compact and small this stick is. It is perfect for travel or for sticking in the diaper bag. My current baby sunscreen is a huge tube that weighs a TON...it really weighs my diaper bag down. So, this stick is great. All you do is twist the dial on the bottom like you would when using deodorant and then just smooth it over your skin. Aveeno Baby Sunscreen is fragrance-free, hypoallergenic, non-comedogenic, and oil-free, making it so great for babies...I love it. I think the part I love the most is that you don't have the mess that you typically experience with liquid sunscreen. This is just like deodorant...it is firm so it isn't sloppy and doesn't get all over the place. I applied a small amount on my arm to see how it felt and it was very easy and smooth to apply. It also stayed exactly where I put it and didn't run or smudge. The Aveeno Baby Natural Protection Sunblock Stick is available at food, drug and mass merchandise stores nationwide and retails for $8.99 - $9.99. You can also check out Aveeno on Facebook and see their latest in news and promotions! 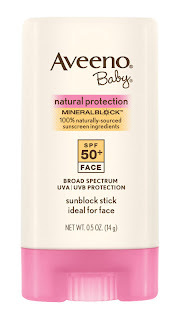 So, in my opinion...the Aveeno Baby Natural Protection Sunblock Stick is really great! I love how compact the container is and how easy it is to apply. The ingredients are also very gentle and rest assured...with Aveeno as the manufacturer, you are getting a truly natural product! Disclaimer: I received no monetary compensation for this post. I did receive free a Aveeno Baby Product for review purposes. All quotes and stock photos are from the Aveeno website and email. All thoughts and opinions are 100% mine.